To some people, maybe, but to those who went to college in UP (or nearby schools), isaw is more like everyday fare. I still remember when I was a freshman. I hated it. I hated the new faces. I hated having to stay in a dorm. I hated the common bathrooms. I hated the noisy jabbering of the people in my wing. I hated having to participate in dorm activities. I hated having to follow the curfew. Most of all, I disdained the food that I had to eat in the dorm cafeteria. But there is one day that I will never forget: the day that I discovered isaw. I had never tasted isaw before that day. As a child, I had a sensitive tummy, and practically anything strange that I ate would send me to bed, wriggling in pain. It would also set off a series of visits to the loo. As such, my parents would always steer me away from "street food" as we call it here. So you can just imagine how much I steered clear of the isaw place in front of Kalayaan, the dorm for freshmen in UP. More often than not, however, I would find myself needing more food after each meal in the cafeteria. The food portions were always too small, and there were times that I just would not eat because the meal didn't taste good. On one such night, a couple of high school friends were able to convince me to try the isaw across the street. After all, my stomach was already going crazy because of the dorm food. Isaw couldn't make things any worse, right? They were right. Not only did the aroma entice me (it smells just like bbq), but my first bite of isaw dipped in a spicy vinegar sauce was like heaven. Maybe I was just starving at that time, but man, was I hooked! Since then, isaw became a regular part of my college life. Hungry? Get some isaw. Back then, one stick only cost 1 peso. (Yeah I am that old.) Ten of those buggers, washed down with a bottle of Coke, would fill me up. Isaw is a street food from the Philippines, made from barbecued pig or chicken intestines. The intestines are cleaned, turned inside out, and cleaned again, repeating the process several times. They are then either boiled, then grilled, or immediately grilled on sticks. People, take note of the emphasis on cleaned, turned inside out, and cleaned again, and again, and again. This stuff is clean, and it tastes really really good. Ask anyone who has tried UP isaw and they will swear by it. 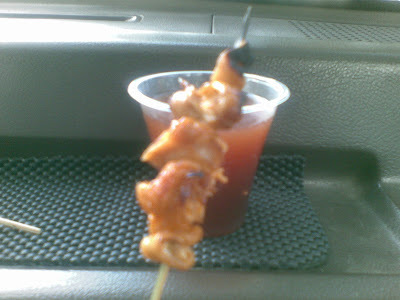 Anyhow, what made me write about isaw? Today, my dad dropped by the house on his way to pick my sister and Sam up. I decided to go along for the ride, and on the way there, decided to pass by UP. 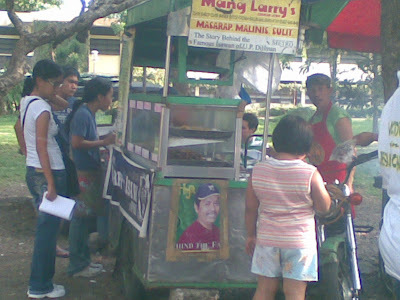 I couldn't help it - I asked dad to stop by Mang Larry's isaw place in front of my old dorm. It is still there, prettied up a little bit. There were still lots of people waiting on their orders. Oh, and you don't merely get your sticks of isaw now. You have to go to this guy who stands on the left side of the stand. You tell him your order and he writes is down on some pre-printed piece of paper. Movin' on up, huh? Here's a piece of pork isaw. The cup holds a mixture of sweet and spicy vinegar sauce. Oh, and a stick costs 3 pesos now. Not bad, only a 2-peso increase. There you have it, the lowly isaw. Exotic or not, you just gotta love it! Sorry to double comment--is that okay? Weird question: have you ever heard of Cherifer? I think that's the name--supplements from the Phillipines that make people grow taller (supposedly). Do you think it works? Ahhh...tripe, another thing I like. It has to be cooked for the longest time, though. I love this Spanish-Filipino dish called "callos," it has tripe. As for Cherifer...lol you never cease to amaze me. Yes, I know what it is, I think my younger cousins take that stuff. I don't know if it really works, though. Why do you ask? I asked about Cherifer because I have considered getting it for some of our shorter family members (who are still growing). I am short--but it fares nicely for girls--don't you agree? (Are you short? I can't tell by your photos--only that you're real cute:). I ordered some Cherifer. I will update you as soon as I hear (or don't hear) about any results!! !